Lady Violet Greville was the daughter of the Duke of Montrose and his formidable wife Caroline, and became, in the 1880s and 1890s, the author of a ladies column in the Graphic. In the following piece, she minces no words about the presence of bores in late Victorian society, and it seems we in the 21st century have yet to escape these types of people! 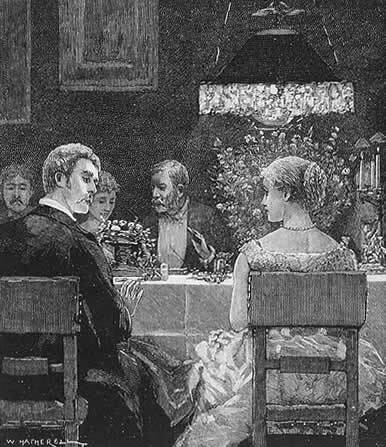 A certain number of people serve at parties the purpose of what, in theatrical language, are called “feeders”; though unimportant in themselves, the whole of the play turns on their doings and sayings. First comes the elderly maiden or dowager, who goes everywhere, who is neither young nor attractive, nor brilliantly clever; very often not even rich, yet useful in her way. She introduces the impecunious somebodies, who want to dine, to the rich nobodies, who desire to give gorgeous feeds. In herself, the elderly maiden, whose attractions for anybody but the second-hand clothes-dealer are nil, has no merit -r but as a feeder she becomes very necessary. People ask one another who is Miss Seraphina’s latest friend, and is she very rich; this is a sine qua non—for the whole of one season at least, till the parvenue kicks down the ladder by which she has risen. Miss Seraphina lunches, dines, and sups gratis, and invites her friends to do the same. London Society is now so large that these social go-betweens have become absolutely necessary; yet they are bores too. Wherever you go, you meet them, puffing and important—at Royalty’s crushes, or in a prominent place at a first-night dramatic performance, or in the sacred precincts of the private view. They are ubiquitous, like flies, and, like some tropical flies, they can sting too. Then there is the aggressive bore—the man who has made his money in dead-meat, or whiskey, or American mines, or guano, or some extraordinary pigment, and is never tired of telling you how rich he is, and what everything in his house cost, until you feel qualified to sit down and write out a price list on the spot. The man who raves about his handsome wife (a solid piece of flesh, clad in ultratight Parisian clothes), and her influential relations, who descants by the hour on his French cook or his high-priced wines, as if none had ever eaten or drunken before, and as if people of quality did not always dine well ; the man who stuns you with the enumeration of the large sums his pictures cost, or the rarity of his objets d’art. No doubt he is glad to have them, yet the pleasure conferred on his friends by hearing of their merits is somewhat damped by the reflection of the altruistic feeling it requires to rejoice with him. A not less tiresome bore, though very human in her way, is the would-be “smart” person whose life is made up of wishes and regrets, who desires to be among the guests of some great big-wig, and incessantly regrets that she is not. She drags duchesses and marchionesses galore into her conversation, and boasts of her intimacy with dear Lady So-and-so, whom she has probably seen only once when her ladyship received her respecting the character of a servant. She carefully drops the good honest people of her own old acquaintance, while loudly lamenting that they are not in her set. She is always on the fringe of good society; like a frontier state, she is perpetually in hot water, between her fear of not doing quite the right thing, and her dread of being in the least degree affable or kindly to her inferiors, lest she should not be thought ” smart.” Such a woman’s life must be one long period of misery and humiliation; for however tenaciously she may cling to the fashionable circle, there is always some one a little more fashionable just above her; till, like the fox in the fable, she sees too late that grapes are sour. In fact, the special advantage, apparently, of being born a lady is, that you need not try to be one,—which, at any rate, saves a great deal of trouble. After these, the inexpressibly exquisite young man, to whom the cut of a coat, or the set of a shirt-front, or the shape of a tie is an all-important matter, seems quite refreshing—that is to say, so long as you are not suffering from headache ; for in that case, the mingled odours of pungent scents and strong tobacco, which he exhales from his person, will vex your Philistine soul. At least, in the days of the old beaux, tobacco was an unknown luxury. Lord Foppington himself snuffed only in a delicately haughty way, with an occasional pinch out of a diamond-studded snuff-box; and his brother’s invective, “Thou essence-bottle, thou musk-rat!” seems far-fetched, compared with the modern mixture of scent and smoke—quite the most nauseous of compounds—the natural inference to be drawn being that the scent is used to conceal some evil odour. These may be called the aggressive or pungent bores, among whom I include the sporting bore, who talks of nothing but his wonderful shots, his marvellous prowess, and his feats of activity; the musical bore, who informs you he has gained a note in his vocal register since last you saw him, and expects fulsome admiration for his feeble compositions or his rendering of familiar songs; the literary bore, who manoeuvres to make you buy his books, sending you a copy of his last novel, with ” From the Author” writ thereon in large letters. This volume proves an expensive gift. It means that you must puff the work, or buy some more copies, or review it favourably, or ask some friend’s friend to give it a notice, or, if you should chance to be a solicitor or a barrister, do the author’s legal business for him henceforth gratis. It is so difficult to refuse a man who has made you what he deems a valuable present, even though it be only a feeble volume of his own composition! Oh dear, I hope I’m not a literary bore! Good Heavens! I’ve been to gathers with all those people, in the last year. And, that business about the “literary bore” hit home.